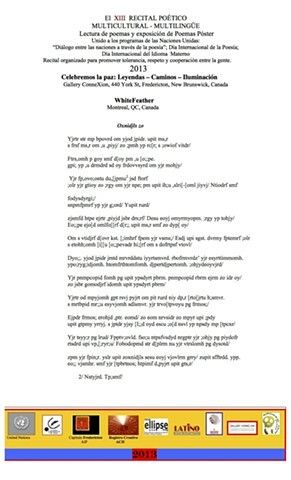 A poem written on the theme of the Izbushka/Baba Yaga, transcribed by moving my hands over by one key on the keyboard to create nonsensical language, rendering the poem coded and mostly indecipherable. Published as part of the El XIII RECITAL POETICO MULTICULTURAL - MULTILINGUE Lectura de poemas y exposicion de Poemas Poster at Gallery Connexion, Fredericton, NB. This is a United Nations event on the theme of promoting tolerance, respect and cooperation among people. Ironically, the poem is about not being able to live with someone. Ftrs,omh p goy smf d[oy pm ,u [o;;pe. Dyo;;. yjod jpidr jrstd mrvrddstu iyyrtsmvrd. rbofrmvrdz’ yjr esyrttimmomh. Yjrtr od mpyjomh gpt rsvj pyjrt om pit rurd niy dp,r [rto[jrtu h;smvr. zpm yjr fpin;r. yslr upit zoxnidjls sesu eoyj vjovlrm grry/ zupit sfftrdd. ypp.